Yohko Mano’s sixteenth birthday certainly has not been an occasion to celebrate. The boy she’s absolutely crazy about doesn’t know she exists, and it’s driving her nuts! To top it all off, her loony grandmother has given her an unexpected (and unwanted) birthday present. As it turns out, Yohko is the 107th generation of a family of professional devil hunters - and she’s stuck with the job whether she likes it or not! Now, all of Japan’s devils, demons, and blood-letting creatures of the night have decided to eliminate Miss Mano before she has a chance to learn how to use her newly discovered powers! It’s going to be a very un-sweet sixteen as Yohko’s birthday turns into a demonic bloodbath and a grueling trial by hellfire! 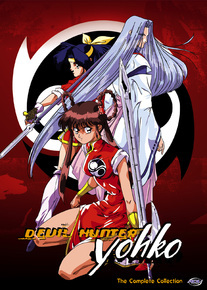 Devil Hunter Yohko, The Complete Collection (SPR $39.98) is a DVD-only release presented on 3 DVD discs in a thinpak box set. The collection contains all 5 episodes of the series with audio in English 2.0 and Japanese 2.0 with English subtitle. In addition, the 3rd disc of the set feature the fun-filled bonus feature Devil Hunter 4-Ever!, a collection of Yohko-inspired music videos presented in Japanese 2.0 audio with English subtitles. Extras include: ADV historical commentary, retrospective of Yohko artwork, Devil Hunter Yohko music video and trailers, clean closing animations: Episodes 5 & 6 and ADV Films trailers.